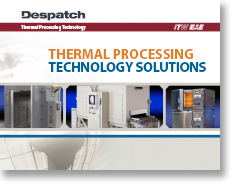 Despatch Industries has specialized in thermal processing for over 100 years and is actively using this technical expertise to provide innovative solutions to critical applications in a broad range of markets and cutting edge technology worldwide. Our innovations are inspired by our customers. Through collaboration in design and engineering, we observe how our technology can best be applied to your needs, giving you a unique competitive advantage. Despatch has three dedicated business groups to meet the demands of the rapidly expanding thermal, solar and carbon fiber markets. This focused commitment has allowed us to become experts in these industries. Our expertise in engineering and manufacturing is backed by our international service and support network. We are truly a global partner that responds locally. Our Legacy: For over 100 years Despatch Industries has specialized in providing innovative thermal processing technology solutions. Despatch has grown and evolved into a global brand that is recognized for providing top quality products and world-class customer service. Despatch has three dedicated business units focused on meeting the demands of the rapidly expanding thermal, solar and carbon fiber markets. Our People: Despatch’s incredible legacy of success is made possible by the talent, passion and commitment of our employees. From sales to engineering to manufacturing, the caliber of employees at Despatch is unparalleled. Our employees have outstanding industry knowledge and expertise. We seek out the most talented and qualified candidates from around the world to join the Despatch team. Aside from our Twin Cities global headquarters, we also have international offices in Shanghai, Berlin, and Taipei. Our Promise: At Despatch, we recognize the importance of equipping our employees with the tools they need to be successful in their career. As the premiere employer in the industry, Despatch fosters an innovative, entrepreneurial spirit by providing a positive work atmosphere that encourages creativity, diversity and personal growth. All positions are located at our world headquarters in Lakeville, Minnesota unless noted otherwise. ITW (NYSE: ITW) is a Fortune 200 global multi-industrial manufacturing leader with revenues totaling $14.3 billion in 2017. The company’s seven industry-leading segments leverage the unique ITW Business Model to drive solid growth with best-in- class margins and returns in markets where highly innovative, customer-focused solutions are required. ITW has approximately 50,000 dedicated colleagues in operations around the world who thrive in the company’s unique, decentralized and entrepreneurial culture. To learn more about the company and the ITW Business Model, visit www.itw.com. ITW Electronics Assembly Equipment (EAE) Division is made up of four brands strongly recognized by Contract Manufacturers and OEM’s in the Electronics and Industrial Markets. The Division designs, develops and assembles capital equipment primarily used in the assembly process of Printed Circuit Boards (PCB’s) and other industrial applications. In 2016 these companies had revenues above $200M and is positioned for above market rates of growth. Performs mechanical engineering assignments of wide complexity under general direction with considerable discretion as to work details. Designs, fabricates, modifies and evaluates complex mechanical and electromechanical devices or systems. Performs developmental and/or test work which requires a comprehensive knowledge of mechanical engineering theory and design. Analyzes, develops and recommends design approaches necessary to meet production requirements for new or improved products and/or processes. Computer skills should include basic PC operation within a MS Windows environment. Specific application experience includes MS Word and Excel. Maintains full responsibility for planning, organizing and conducting technical projects within the design, fabrication, modification and evaluation of mechanical and electromechanical apparatus, components and processes. Conceives and plans projects involving exploration of product and/or process problems, definition and selection of new concepts and approaches to the design or development of new or improved products and processes. Conducts independent technical investigations involving the application of a wide variety of mechanical engineering principles in the origination or modification of materials, components or process specifications and requirements. Normal working conditions involve seated computer work and occasional operation and work on company equipment/products. If you are a qualified individual with a disability and are unable or limited in your ability to use or access the online application system process due to your disability, please email jsoares@itweae.com to request assistance. No other requests will be acknowledged. ITW Electronics Assembly Equipment (a division of Illinois Tool Works, Inc. (NYSE: ITW)), is the global leader in process knowledge, services and manufacture of capital equipment used in the printed circuit board assembly and semiconductor industries. The group brings together the world’s leading brands of electronics assembly equipment: Despatch Thermal Processing Technology, MPM Printers, Camalot Dispensers, Electrovert Cleaners and Soldering Solutions, and Vitronics Soltec Soldering Solutions. For more information visit www.itweae.com. This position supports Despatch Thermal Processing Technology. This individual performs high-level mechanical engineering assignments of wide complexity under general direction with considerable discretion as to work details. Designs, fabricates, modifies and evaluates complex mechanical and electromechanical devices or systems. Performs developmental and/or test work which requires a comprehensive knowledge of mechanical engineering theory and design. Analyzes, develops and recommends design approaches necessary to meet production requirements for new or improved products and/or processes. BS in Mechanical Engineering and minimum 8-10 years of applicable experience. Precision machine design experience is required. Sheet metal design and fabrication experience is required. Experience with Solidworks CAD package - experience with additional CAD packages such as Mechanical Desktop or ProEngineer is a plus. Must have strong written and verbal communication skills, and proven ability to work well at all levels in the organization, including production. Computer skills should include basic PC operation within a MS Windows environment. Specific application experience includes MS Word, Excel, and PowerPoint. Responsible for completion of equipment orders to prescribed technical specifications and cost goals.